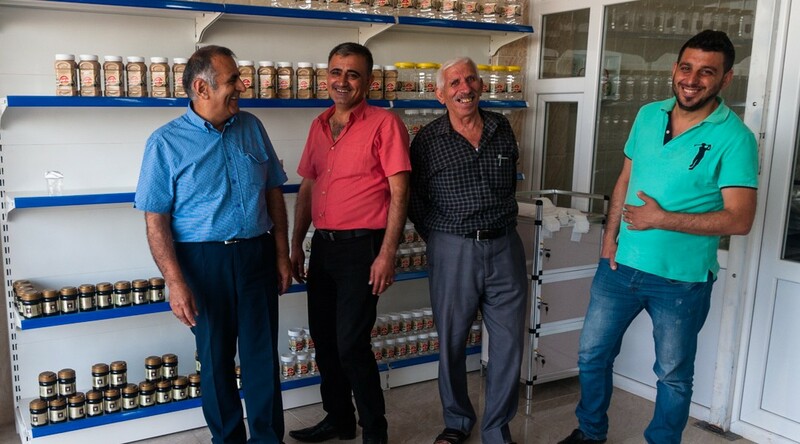 STORY – In Sulaymaniyah, in the north of Iraq, Fraternity in Iraq has opened a sesame paste factory, enabling a displaced family from Qaraqosh to get their jobs back. This factory is part of the development mission the association leads among the exiled minorities in Kurdistan. In Sulaymaniyah, in the Kirkuk dioceses, Fraternity in Iraq remained true to its mission to give their job back to displaced Iraqis. 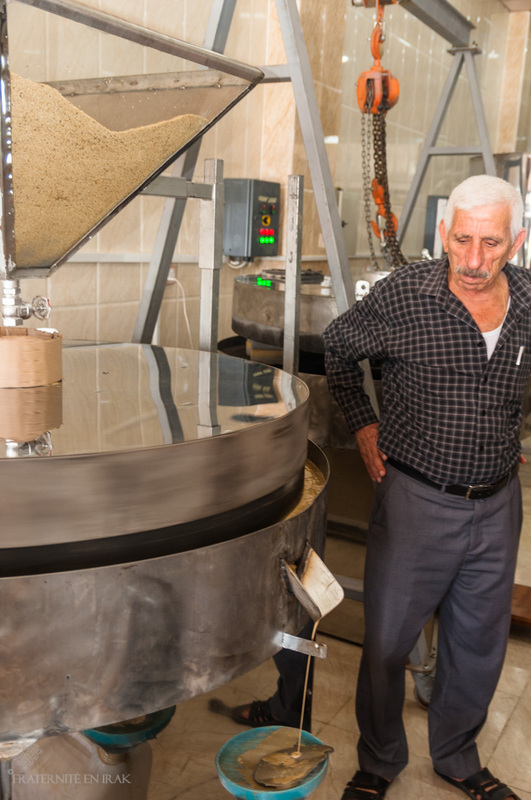 The association chose to finance a sesame paste factory, called « rashi » or « tahin », and consumed daily in Iraq. 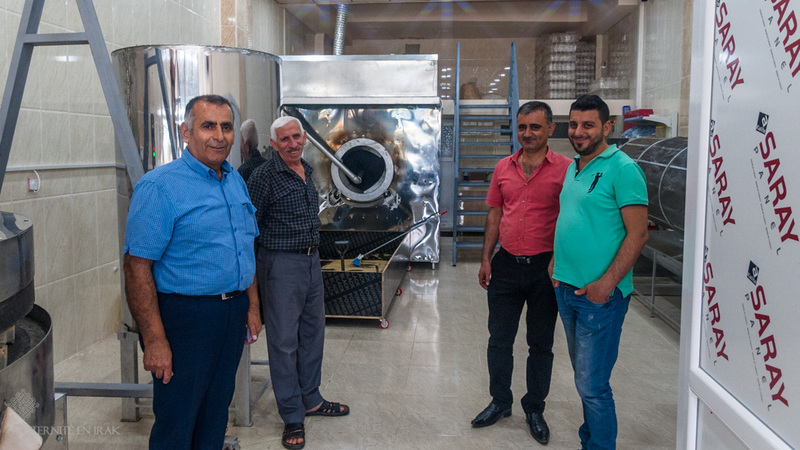 This project, led by Fraternity in Iraq under the aegis of the dioceses, was made possible thanks to the craftsmanship of the Baqtar family, who took refuge in the area two years ago, coming from Qaraqosh where they owned a similar factory. Their factory had been active for more than twenty years, with six presses and an impressive revenue: ten billions dinars per year! (approx. US$ 8.5 millions) They also owned a hen house and several businesses. This economic prosperity all went down with the arrival of ISIS, and in the night of August 6, 2014, the family had to flee the city. 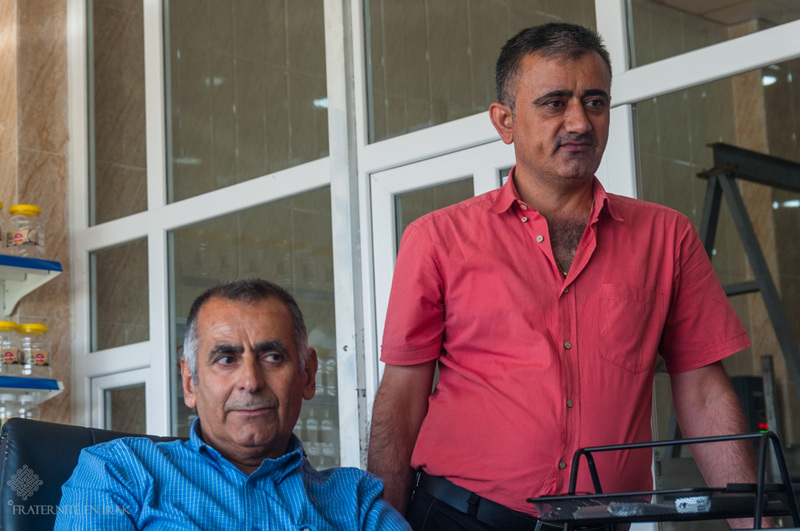 Today, five family members work in the factory, located close to the Sulaymaniyah city center, under the authority of a local Kurd manager, Nabil. Yelda, 64 years old, a retired teacher, was the factory manager in Qaraqosh. His son Alan, in his thirties, has a wounded foot and doesn’t have enough money to undergo surgery and find a job somewhere else. Roni is a former architect who can’t find any job meeting his qualifications. He came with his father, Siman, and his brother-in-law, Barack. Roni and Alan had just finished to build their houses in Qaraqosh, for 200 millions dinars each (approx. US$ 170,000). They have never had time to move in. Today, they are crammed in one single room. To ease these difficult conditions, they all work towards the making of the famous « rashi » from Qaraqosh, already renamed « rashi of Sulaymaniyah ». 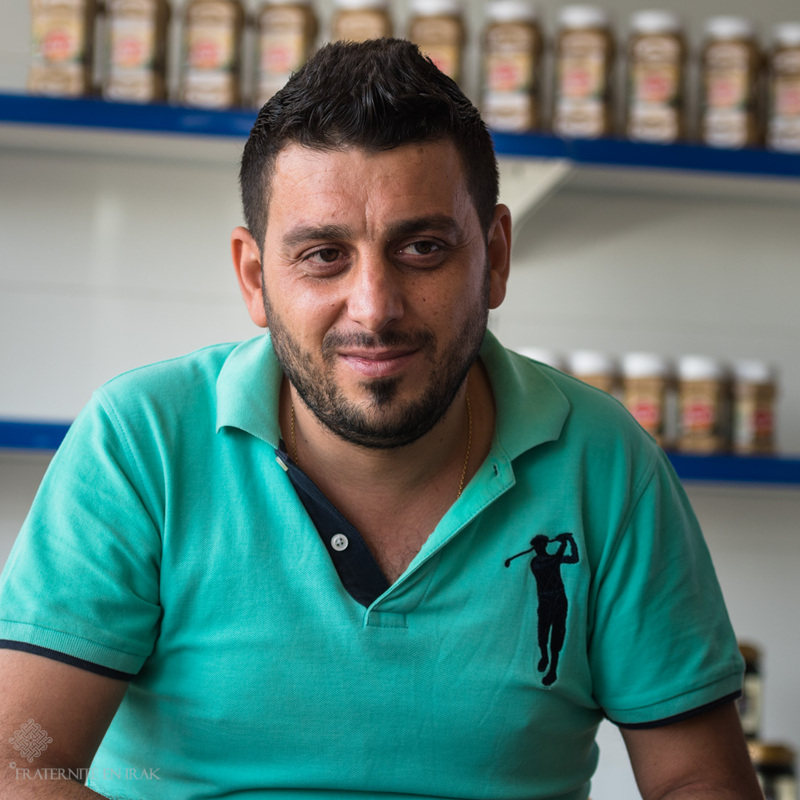 The Baqtar family members were rashi experts in Qaraqosh, where they had built a strong reputation, and where the factory worked 24/7. 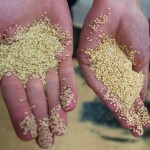 They have decided to produce a high-quality sesame paste: the sesame comes from Afghanistan and is washed; the final product is 100% natural, without added fat, unlike most of the rashis on the market. 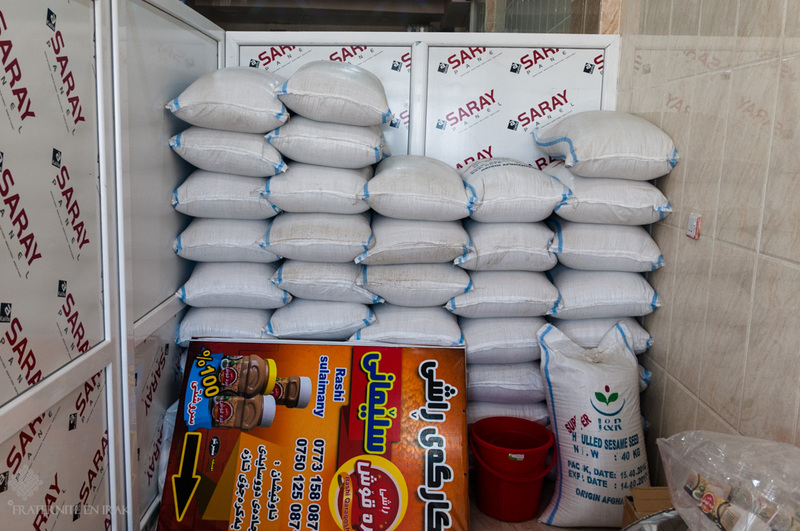 However, the productivity is good : it takes thirty minutes to fill a 1.75 lbs container (800g), which is sold 3,000 dinars (approx.US$ 2.56) for a 2,000 dinars (approx.US$ 1.71) production cost. The factory produces three types of containers, from 0.8 lb (400g) to 3.95 lbs (1.8kg). 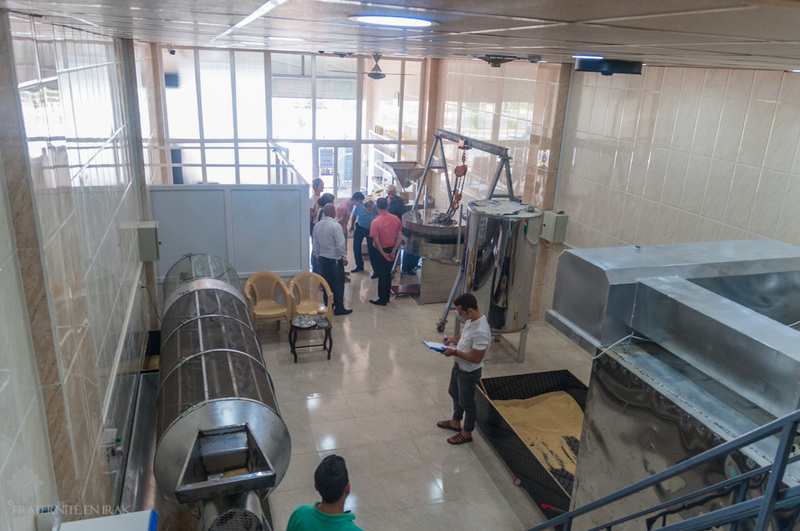 Sesame oil, which takes longer to make, is produced on demand, and a 0.8 lb container is sold 10,000 dinars (approx.US$8.54). The inside of the factory. On the left, the rotating sieve that sorts the seeds. 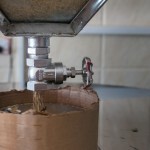 The « rashi » factory is made of three machines: the first one is an oven that roasts the sesame seeds; the second one, a sieve, washes and sorts the roasted seeds, and the third machine is an electric press from which drips the precious cream. A fourth machine completes the set: it places a stamp on the containers, in compliance with the law, which will enable the business to develop trade partnerships throughout the country. The factory operates all year long except during the four summer months: high temperatures don’t go well with rashi consumption! 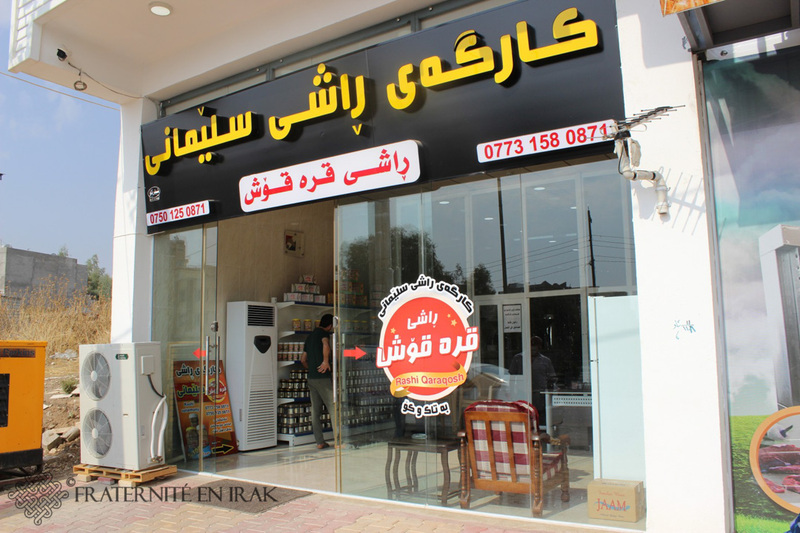 This fall, the beginning of the season was good: the small and big formats were sold on the Sulaymaniyah market. For now, the employees don’t earn anything, as all profits are reinvested into raw material, but the factory now belongs to the dioceses that will use future benefits to generate new projects.